Fannie Mae, Mortgage Bankers Association, Appraisal Institute, National Association of Realtors and ForeclosureRadar to join real estate analyst Bruce Norris on Oct. 19th at the Nixon Presidential Library to discuss the economy, pending legislation and solutions to the real estate crisis. YORBA LINDA, Calif., Aug. 3, 2012 – Real estate professionals who are trying to make sense of contradictory market behavior, including high levels of mortgage delinquencies and a record low inventory, can learn about the latest industry trends from top experts at the upcoming “I Survived Real Estate” charity gala. High rates of default typically result in many properties entering the market through the foreclosure process, but the housing market has been anything but typical lately. That has made it difficult for real estate professionals to formulate successful business models. Add in the efforts of federal regulators and legislators seeking to boost the economy and solve the real estate mess, plus a new effort underway by local municipalities to “condemn” selected mortgages through eminent domain, and there has never been a better time to take advantage of the insights available through this unique event. “From the Qualified Residential Mortgage debate raging in Washington, D.C. to the use of eminent domain on mortgages, real estate professionals are operating in a market full of uncertainty,” according to Bruce Norris of The Norris Group, which is presenting “I Survived Real Estate” for the fifth consecutive year. The panelists will provide important insights into what real estate professionals can expect moving forward, according to Norris, who has built a following in the real estate community and with news reporters after producing consistently accurate real estate forecasts. They also will identify potential solutions to the crisis, as well as opportunities for real estate professionals and investors. Proceeds from the Oct. 19th “I Survived Real Estate” event will be donated to Make-A-Wish® Orange County and the Inland Empire, and to St. Jude Children’s Research Hospital. During the past four years, the event has raised more than $250,000 for charity in the fast four years. “I Survived Real Estate” officially launches this weekend on The Norris Group Real Estate Radio Program. Every weekend leading up to the event, Bruce Norris will interview a panelist or local expert about current market conditions within that expert’s area of expertise. This week, Bruce is joined by REO and short sales experts Mike Novak-Smith with RE/MAX, Lance Martin with Coldwell Banker Pioneer, and Steve Silva with Market Point Realty. The four long-time industry experts specifically discuss the Inland Empire foreclosure market trends, the shortage of inventory, and the strategies banks are using to dispose of properties in the California market. Norris regularly interviews economists, government officials, association presidents and other industry thought leaders on his weekly real estate radio talk show, which airs at 6 p.m. Saturdays on KTIE 590 AM in San Bernardino. Podcasts of Norris’s radio interviews can be accessed through his company website, www.thenorrisgroup.com. 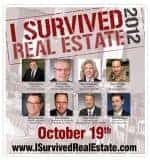 “I Survived Real Estate” has more than 25 sponsors, including ForeclosureRadar, HousingWire Magazine, Investors Workshops, InvestCLUB for Women, the San Jose Real Estate Investors Club, and the San Diego Creative Investors Association. For tickets and other information regarding the Oct. 19th event, visit www.isurvivedrealestate.com. Reporters seeking interviews with Bruce Norris and panel participants before or after the event should contact Aaron Norris at (951)780-5856.